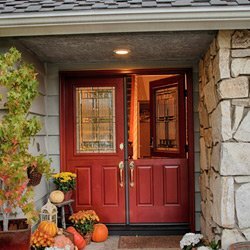 You may be one of the many people wanting to change your current deadbolts to keyless entry, but is still looking for ways on how to install an electronic lock on a door. I am here to tell you that it is not as complicated as it may seem, and I will give you step by step instructions on how to complete such a task. Gone will be the days when you have to stand at your door much longer than you wanted to, all because you can’t find your keys, or because you are having trouble opening the door. Having an electronic lock installed on your door will give you a new level of convenience, and peace of mind. Here is how it works. Be sure to have the necessary tools lined up for your project before you get started. This will definitely save you a lot of time and frustration. You will need a Phillips or Flathead screwdriver depending on the type of screws you will be using. A 4-in-1 screwdriver would suit you best because it comes with double-ended bits in several different sizes that accommodates a variety of applications. 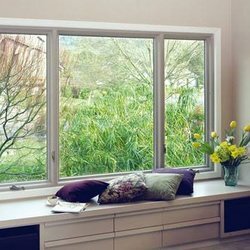 You will also need the recommended battery/batteries for your electronic door lock if not accompanied with your package, and of course, the electronic door lock itself. It will also be easier for you to separate the contents of the package that your lock came in. Lay them out in the order that you will be needing them. After making sure that everything is together, you can get started. First, start by removing the old bolt, and also the handle if you wish to replace that as well. You must first install the outside keypad. Place your new dead bolt to line up with the existing backset, which should measure 2-3/8-in. or 2-3/4-in. These are the two common backsets for residential door locks, and are measured from the edge of the door to the center of the dead bolt hole. Ensure that the “TOP” is facing up and the bolt should be retracted fully. Hold the keypad upright and slide the battery cable above the dead bolt,and place the driver bar through the center slot of the dead bolt. Next, install the inside mounting plate. Pull the battery cable through, then hold both the inside mounting plate and the keypad together and tighten the screws. Your next step would be to hook up the battery. Make sure that you are inserting it the correct way, and snap it in place. Make sure that all the wires are tucked out of place and that the inside plate and keypad are level, then you may screw on the cover plate. Keep your door open and check to see if the dead bolt extends and retracts with ease. If it does not, you will have to disassemble the lock and make sure that everything is installed correctly. With everything working properly, just punch in your code and turn the latch to unlock the dead bolt. Many locks come with unique pre-programmed codes that you can change by following the programming instructions for the lock. There may be times when your lock will malfunction or lose battery power, and for this reason a key is also included with your package, and when your battery needs replacing, the lock will send a signal to notify you. Now that you have installed the electronic lock, be sure not to lose the programming guide as it contains the user and programming codes, and also the instructions for changing them. If for any reason you feel as if you encounter a manufacturer that you are not familiar with, websites such as Kwikset gives you step by step instructions on how to install many different types of electronic locks. 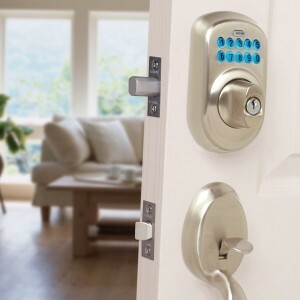 Now you can take a deep breath and relax, knowing that you will not have to worry about your keys getting lost, and your children and/or allowed family members can enter your house with ease when no one is home to let them in. You don’t even have to get soaked on a rainy day trying to figure out which one of the many keys on your key chain is your house key, and for the most part, you are now equipped with the knowledge to share with a friend or family how to install an electric lock on a door without having to contact a professional, and running in and out for them will be an ease.